You know what I’m thankful for? Having enough full bust companies out there to make it worth publishing a sales roundup for Black Friday and Cyber Monday! (Thanks for the idea, Kelly at Bitter Lollipop.) Check for updates as I hear back from other companies. The DD Atelier 20% Birthday sale with promo code BIRTHDAY is going on for the entire month of November. Special offers for Black Friday will be posted online on Thursday night, and special offers for Cyber Monday will be posted online on Sunday night. On Friday, November 27th the entire More Front Room store will be 40% off with free shipping on orders over CAD$99 (usually $250) with promo code BLACK40. Subscribers to our email list will get early access to the sale starting Wednesday, November 25, with a special promo code. From Black Friday through Cyber Monday, receive 25% off the Signature One and Only Shirt with code LYLBH0VLF30M (good from 12:01 am, Nov. 27, to 11:59 pm Nov. 30). 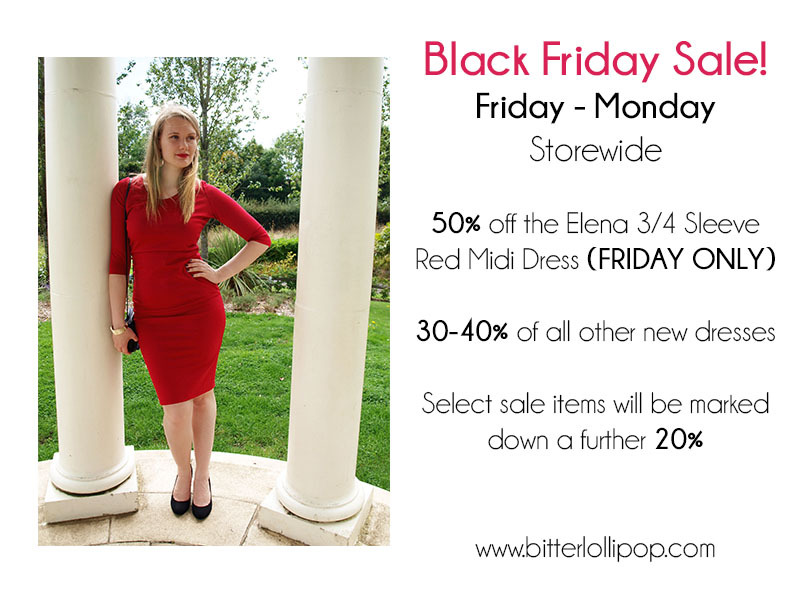 You can receive 20% off at Bolero with code HOLIDAY20 now through December 25! The Erica dress has just been reduced from $170.00 to $140.00. Adding the HOLIDAY20 code at checkout makes for an even more spectacular deal.Also reduced: Jenna dress from $185.00 to $150.00 and the Hanky dress from $130 to $120. November 25, 2015 | Comments Off on Full Bust Clothing Black Friday & Cyber Monday Sales!! !